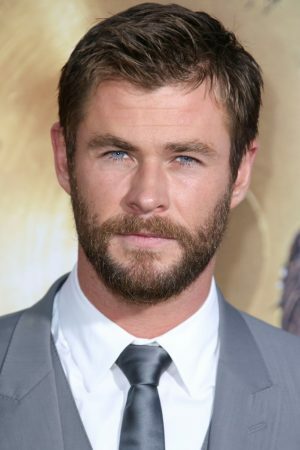 Actor Chris Hemsworth is best known for his role as Thor. When Hemsworth was first cast as the hammer-wielding god, he gained 20 pounds of muscle! So it is certainly understandable that a regular workout is important to the 32-year-old, who wrote the introduction to Dr. Eric Goodman’s book True to Form: How to Use Foundation Training for Sustained Pain Relief and Everyday Fitness. Goodman has studied movement and human physiology for years, and he has helped teach people how to live pain-free and healthy. Hemsworth notes that the tips in the book are especially useful for back pain. He incorporates them into his daily workout, and he feels stronger because of it. Hemsworth also believes that a sedentary lifestyle is an epidemic of chronic pain, and can cause consequences such as poor posture and stress on the joints. It can also weaken muscles and restrict organ function. 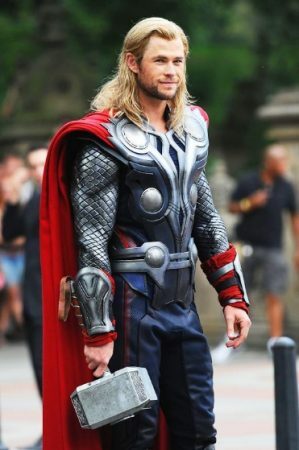 Photo: Chris Hemsworth as Thor. 09/02/2011. Credit: Doug Meszler / Splash News. How we live is fundamental to our health—and Hemsworth knows that his diet and workout are important components to his overall health. Before Hemsworth was cast as Thor, his body was quite lean. But, after being cast as Thor, the (what I dub) ‘Chris Hemsworth workout plan’ replaced cardio workouts with heavy lifting at the gym. His training routine includes core workouts that improved muscle mass. Hemsworth’s trainer Duffy Gaver incorporates cardio and abdominal circuit workouts. The exercises also include chest, legs, and arm workouts to build muscle mass. Hemsworth’s workout plan works so well that he allegedly couldn’t even fit into his Thor costume at first! As a result he had cut down to size and use kettle bell exercises, such as kettle bell swings, cleans, squats, and windmills. What about the (again, what I dub) Chris Hemsworth diet? He is said to eat nearly 6,000 calories daily of lean protein and produce. Some of his preferred diet choices include egg whites, chicken, steak, fish, potatoes, spinach, broccoli, grains, nuts, berries, and nuts. Basically, it takes a lot of work to become Thor. Chris Hemsworth not only knows how to get in shape with the proper workout and diet—he understands how to harness the body’s natural movements to avoid back pain. “Chris Hemsworth Workout Routine & Diet Plan,” Fitness Hacker website; http://fitnesshacker.com/chris-hemsworth-workout/, last accessed July 12, 2016.